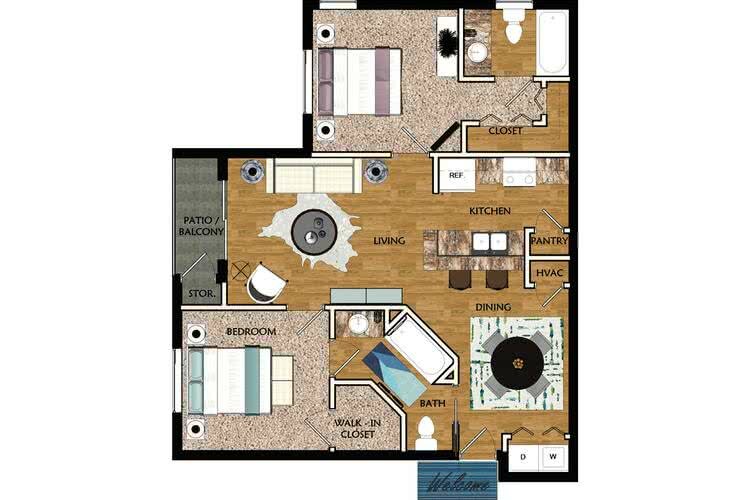 Our Jasmine 2 bedroom apartment in Riverview, FL is our premier home located in one of our 3 mid-rise elevator buildings. The incredible home features all of our luxurious amenities including granite counter tops, stainless steel appliances, wood style flooring with matching cabinetry, over-sized closets, pendant and track lighting, a gourmet island kitchen, full size washer and dryer, a built in microwave, screened lanai and one free storage unit. You can also choose to upgrade your new 2 bedroom apartment in Riverview, FL to include a front loading washer and dryer, a reserved garage or carport parking space and a preserve or river view. 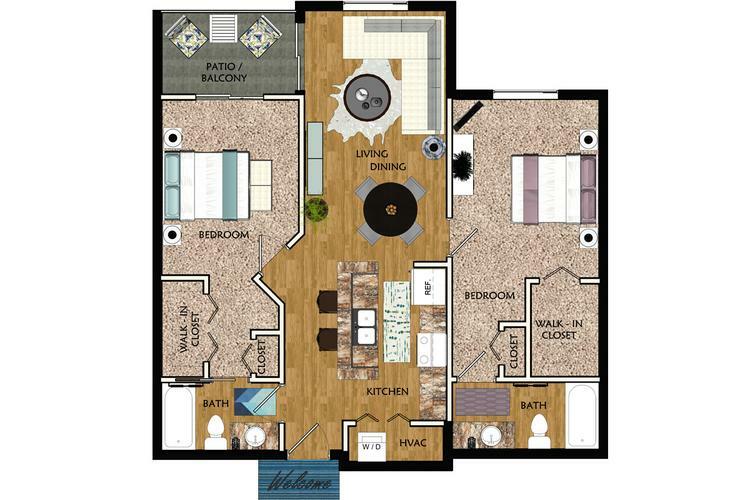 Our Gardenia floor plan is a gorgeous two bedroom, two bathroom home and is located in one of our garden buildings. Each home features stainless steel appliances, full size washer & dryer, wood style flooring with matching cabinetry, over-sized closets, a separate living/dining area, a breakfast bar, pendant and track lighting, screened lanai, valet trash* and one free carport. You can also choose to upgrade your new home to include granite counter tops in the kitchen and bath, and a preserve view. 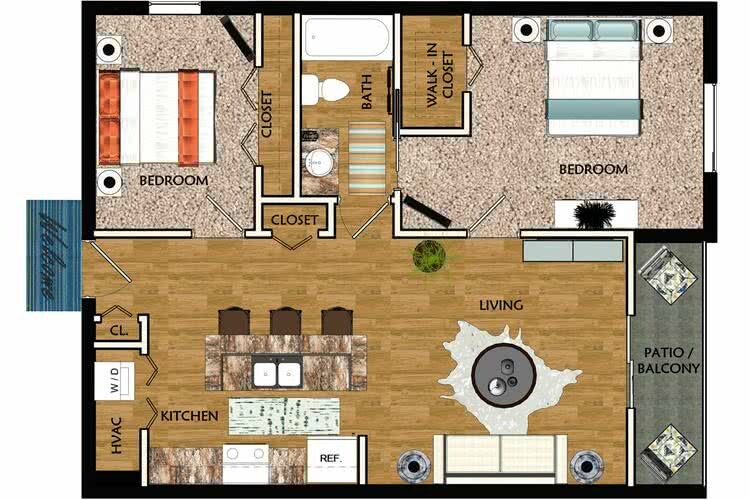 Our Jacaranda floor plan is exquisite and features two huge master suites and tons of storage space. They are located in one of our 3 mid-rise elevator buildings and have all been upgraded to feature granite counter tops in the kitchen and bath, oversized closets, a huge garden tub in the master bathroom and one free storage unit! You will enjoy all of our luxurious amenities including stainless steel appliances, wood style flooring with matching cabinetry, pendant and track lighting, over-sized closets, a gourmet island kitchen, full size washer and dryer, a screened lanai and one free storage unit. You can also choose to upgrade your new home to include a front loading washer and dryer, a reserved garage or carport parking space and a preserve or river view.